Last weekend I finally got my hands on a beer I have literally been waiting on for months. This is no ordinary beer. This beer is an American Porter, that has been aged in a port wine barrel from Great Frogs Winery, right here in Annapolis. 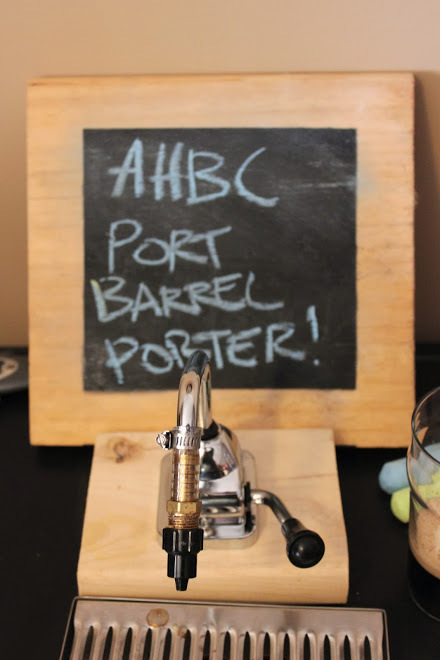 This porter is the latest in a series of beers produced by members of the Annapolis Homebrew Club then aged in barrels purchased by the club. 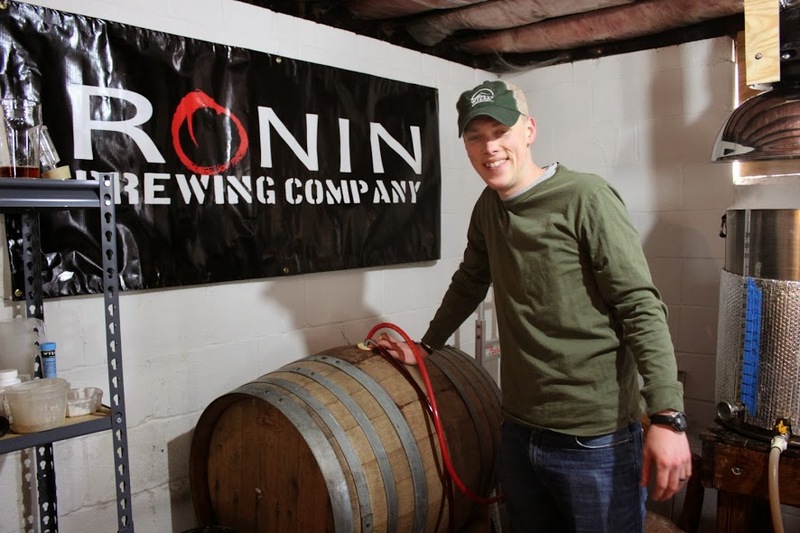 Ten or so club members volunteer for each barrel project, and everyone brews five or more gallons using the same recipe. This beer is all mixed together and placed in the barrel to be aged. 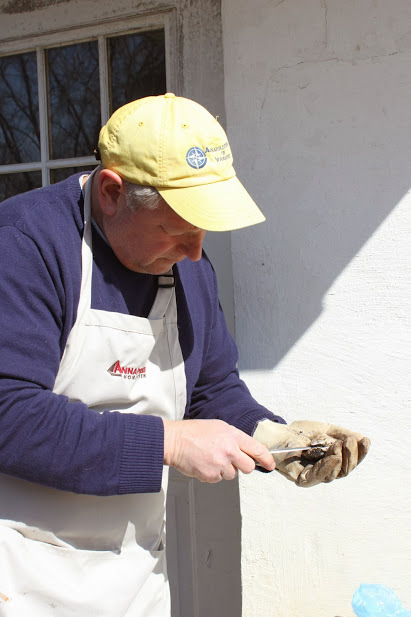 Jeff, the AHBC Club President, transferring his portion into the barrel. 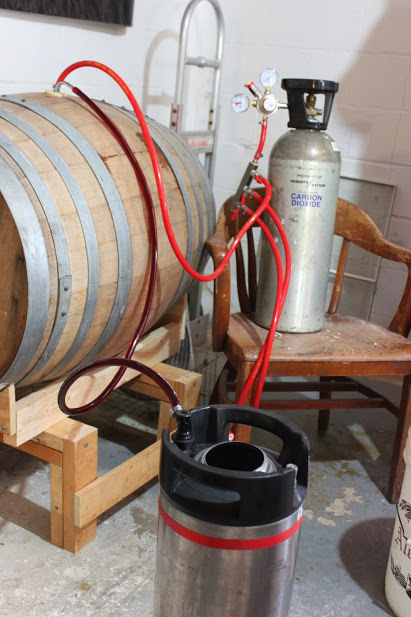 A typical bourbon barrel, or wine barrel usually holds fifty gallons or more, making it difficult for a single homebrewer to fill the barrel with their own beer. 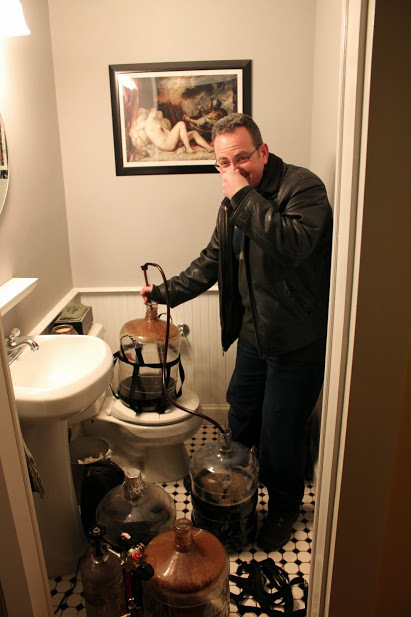 This is one of the reasons a homebrew club is such a great thing. 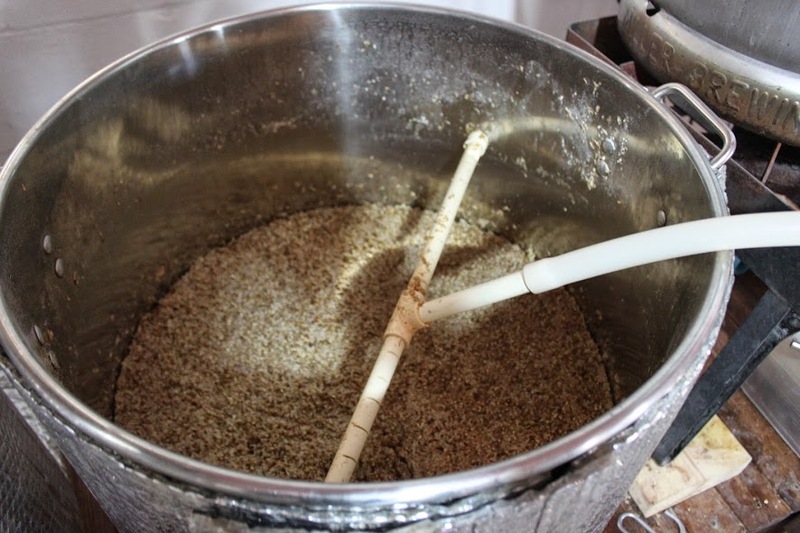 You not only learn how to make great beer from all the shared knowledge, but you get to take on projects that would be too big for you accomplish alone. 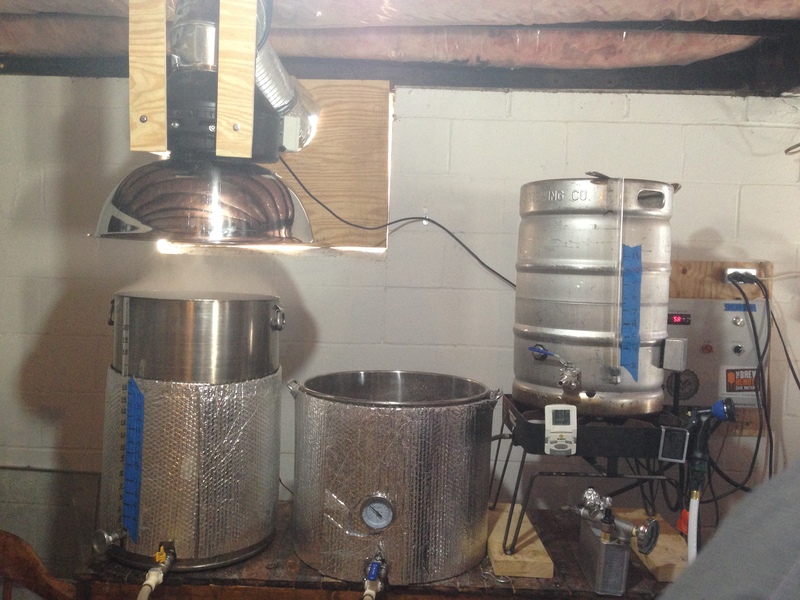 I decided to brew my portion of the beer with my buddy and neighbor Joe. 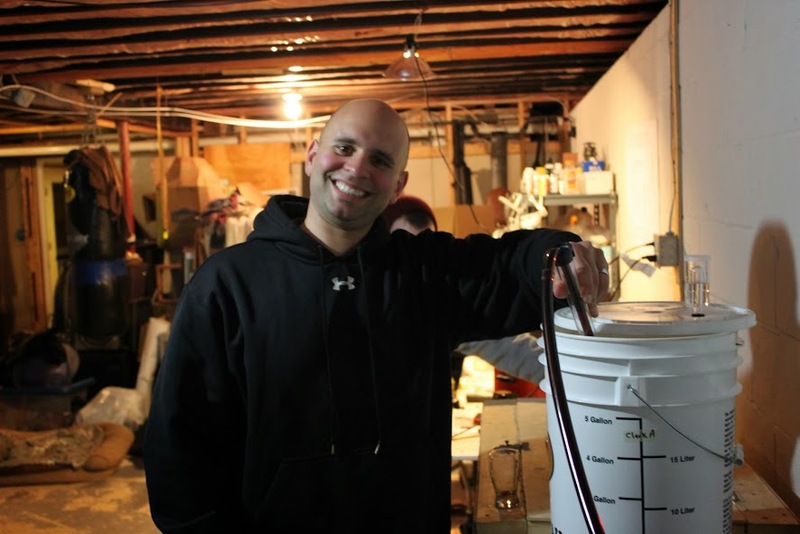 We had a great brew day on Thanksgiving weekend, when it was so cold that the only place warm enough to ferment the beer was in our downstairs bathroom. This made for some interesting conversations with guests for the next few weeks. Everyone participating in the project met up just before Christmas to get their beer into the barrel. Once topped off, the barrel was sealed and left to sit. 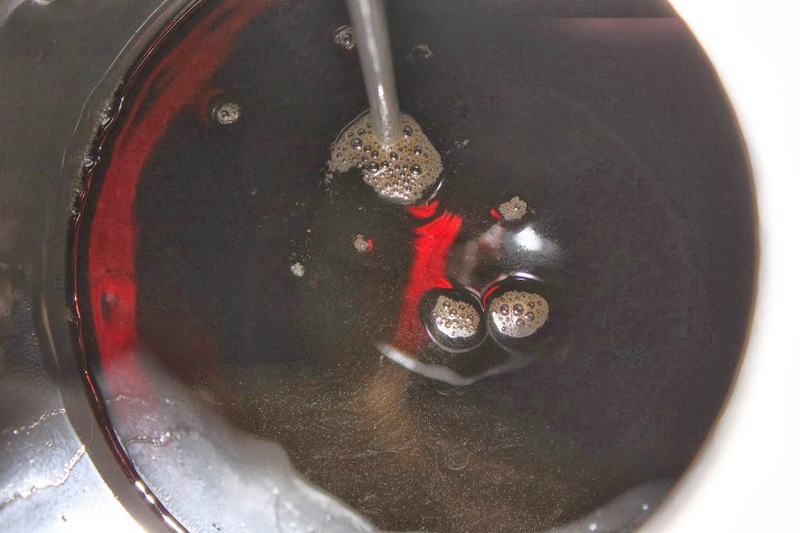 We started taking samples out of the barrel after about a month, and it was finally decided that Saturday, March 1st, would be just the right amount of time to impart a good balance of wine and oak without overwhelming the roasty porter flavor. 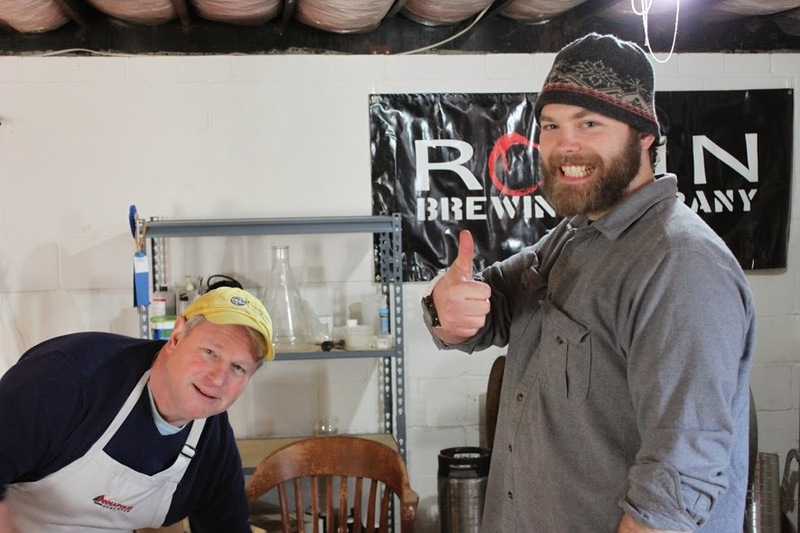 Kevin (right), the AHBC Barrelmeister, letting us know the beer is ready, and Don (left), getting ready to shuck some oysters in his Annapolis Home Brew apron. Barrel emptying day, is usually a bit of party for anyone in the club that wants to show up, and not just those involved in the project. When Joe and I arrived, we were greeted by the magnificent aroma of beer being brewed. 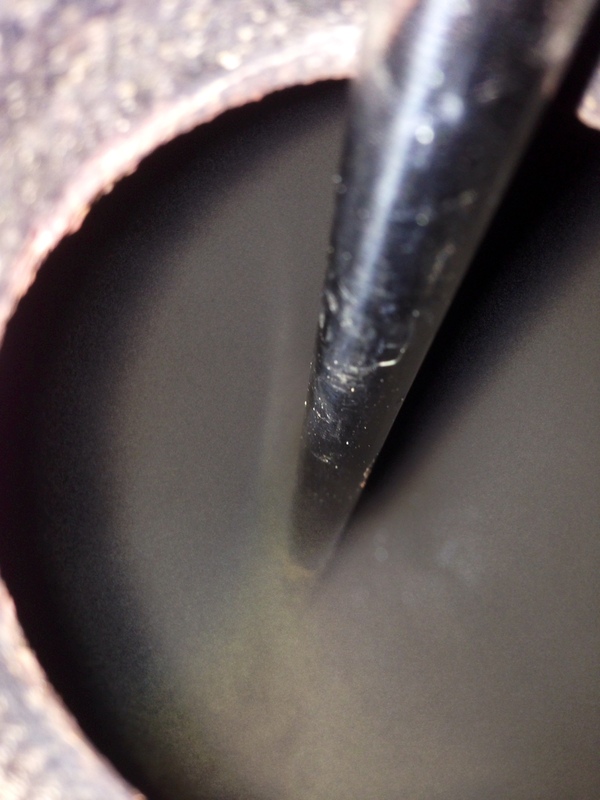 Two club members decided to brew a beer on the same day we were emptying the barrel. Some brand new club members not only got to taste some great beers but also got to see some serious all grain homebrewing in the process. But it wasn’t all beer. 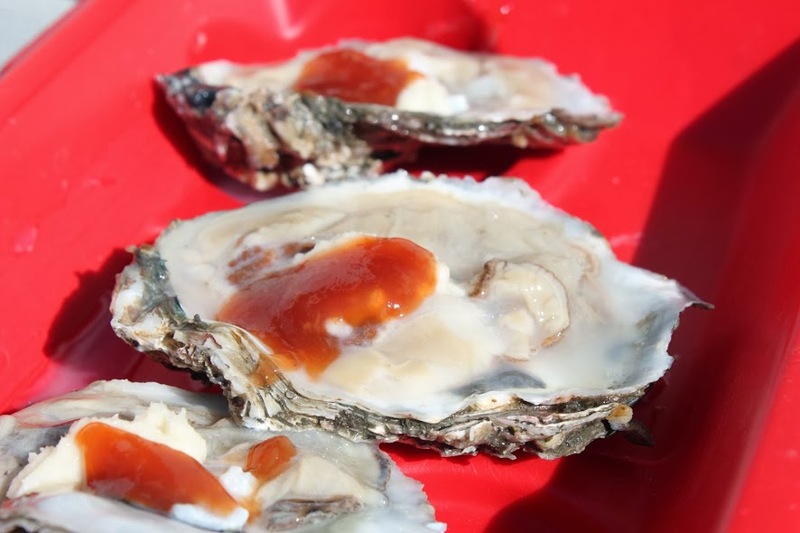 We also enjoyed some great oysters that Don brought along and volunteered to shuck for everyone. 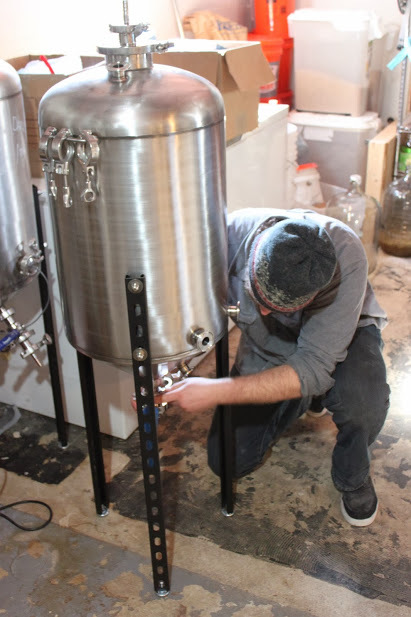 When did we finally empty the barrel with all the beer, oysters, and brewing going on? Well it actually took us a while to get around to that, but eventually we finally started kegging this beer. After several of these projects we’re pretty good at this transfer process. The one thing we still haven’t figured out is how to keep the stopper from shooting off of the barrel after you pressurize it to push the beer out. 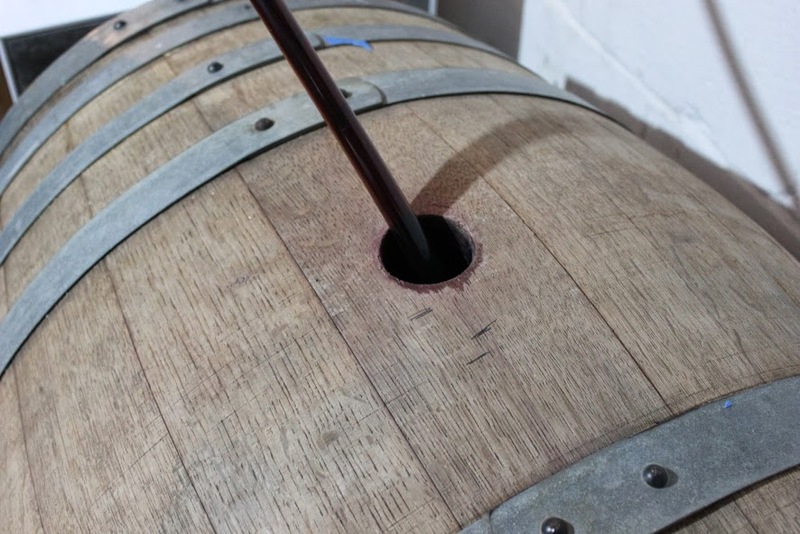 The most labor intensive part of this process is just standing next to the barrel holding the stopper in place so that it doesn’t shoot off the barrel and take out someone across the room. Yours truly, selflessly saving everyone’s lives. It’s hard to see, but we left behind less than a cup of beer in the barrel. 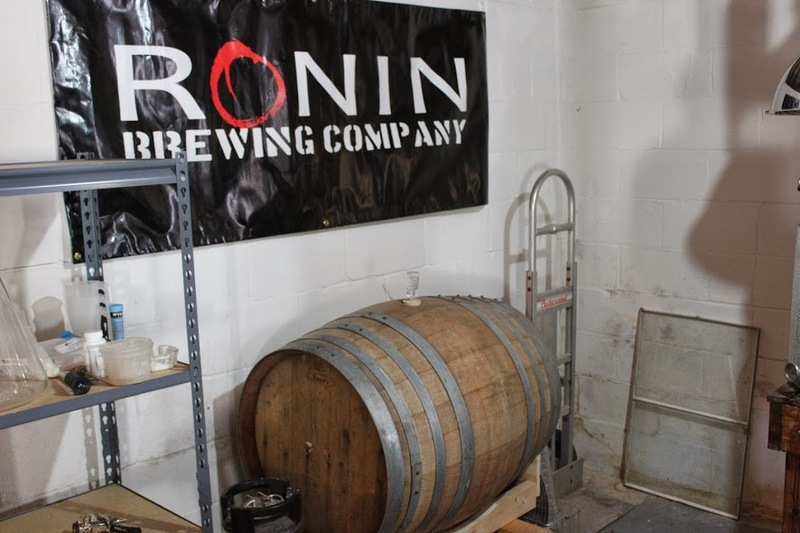 Once the barrel was empty, we refilled it with the next barrel project beer. This next beer is a Belgian Strong Dark that tasted great when it went into the barrel. I really regret not getting in on this one, but I’m sure I’ll get to taste a bit of someone else’s share. So how did the port barrel aged porter end up? The only taste I’ve had so far is from the small amount that we drank on the day we emptied the barrel. The roast malt flavor was still there a bit, but it was definitely dominated by the flavor of wine and a significant amount of oak. I really liked what I tasted. It was unique, it was complex, and it was downright tasty. The flavor may change with some carbonation, and I will have my keg of this beer on tap by the end of this weekend. I will definitely be posting my thoughts about the beer on The Beer Spy Facebook page. The guy in the below picture said it was the best thing he had ever tasted. He looks pretty trustworthy, so I’ll take his word for it. I have to end this by saying thank you to everyone in the AHBC that made this another successful barrel project. Thank you to Kevin for hosting the barrel, Don for the great oysters, and most importantly, Great Frogs Winery for donating the barrel for this project.